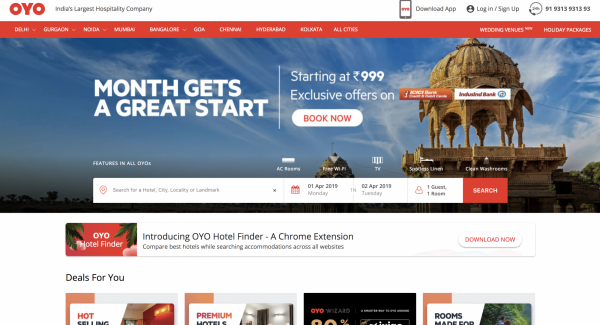 After acquisition of HotelTonight, the reservation website, the Airbnb, which started as a room rental, announced that it has invested in India’s reservation platform OYO, and once again demonstrated its ambition to expand the reservation category. In 2013, Ritesh Agarwal, who was only 19 years old, founded OYO because of his backpacking experience in India, hoping to provide tourists with better quality economic accommodation options. Now OYO, the reservation options include not only budget hotels, but also large-scale major hotels, resorts, and homes like Airbnb. OYO has grown into one of the largest reservation platforms in India in the past few years. The reservations map spans 259 cities in India and has recently expanded to other international markets, including China, Malaysia, Nepal, the United Kingdom, Indonesia, the Philippines and the United Arab Emirates. , you can see the trace of OYO. In September 2018, OYO announced that it has invested $1 billion in E-round financing. Investors include Softbank’s Vision Fund, Southeast Asia’s car service owner Grab, China’s car service Didi Travel, and well-known investment company Lightspeed, Red. Shirt investment (Sequoia) and Greenoaks Capital. OYO’s company market capitalization has now exceeded $5 billion. Airbnb announced that it has invested in OYO, an international reservation platform started in India. According to TechCrunch, Airbnb’s investment in OYO is between $150 million and $200 million. Both companies refused to respond to this. What is certain is that this investment will benefit both. One of Airbnb’s fastest-growing cities is the Indian market. By investing in OYO, Airbnb may combine OYO’s listings to provide more housing options to its users and accelerate growth in the Indian market. In addition, OYO’s market size in China is not to be underestimated. It has expanded to 280 cities in China, offering 5,000 hotels and 260,000 guest rooms. These numbers will also help Airbnb expand further in the Chinese market. For OYO, Airbnb may also be a bridge of opportunity for them to enter the US market. OYO officially operated in the UK market at the end of last year. Airbnb is expected to apply for a public IPO this year. Even if Airbnb’s finances have turned into a profit in the past two years, they are still laying out various investments in the near future, making Airbnb the “only online destination for travel”, with a better look. Convince the public investor. Previous The first IPO’s car service Lyft, the stock rose by 21%, and the market value surged to $22.2 billion.